Get the Most Advanced Trading Tools to help meet all of your online investing needs! Professional trading tools, combined with award winning trading platforms, over 60 different order types, lightning-fast navigation, advanced capabilities and verified best execution truly make Place Trade the smartest place for all of your online trading needs! Sophisticated trading tools combined with over 60 different order types, lightning-fast navigation and advanced capabilities put Place Trader Workstation (TWS) at the front of the pack when it comes to online trading. The default Mosaic includes a subset of tools and tiles, but you can add and rearrange the existing tiles, and open tools as standalone windows. The Mosaic trading tools make it easy to create, submit and modify orders. Depth and breadth of quotes across our myriad Mosaic tools. Find market scanners, charts, labs and more in our robust offering of technical analytics. Use or options labs to create the best strategies for your portfolio. The Volatility Lab offers a comprehensive toolkit of volatility tools that help to provide a snapshot of past and future readings for volume on a stock, its industry peers and some measure of the broad market. News and fundamentals abound throughout the Information System. Research and analysis from top providers. Mathematically value and risk-assess individual option classes (Option Analytics). Interactive Analytics does not support pricing and risk analysis for futures options. Before you use IA, please review the Interactive Analytics Use Agreement and Disclaimer. Portfolio Analytics shows your portfolio risk across multiple asset classes, and allows you to create hypothetical "what-if" risk scenarios by adding, removing and modifying contract positions. Five tabbed pages show specific slices of your portfolio risk sorted by position, underlying and Greek risk dimension. The bottom half of the Portfolio Analytics window displays portfolio- and sub-portfolio value plots, which show the contribution that each contract in your portfolio or sub-portfolio makes to the slope and curvature of the plot. The Option Model Editor, where you view and change the model pricing assumptions. Please review the TWS User's Guide for more information on Interactive Analytics. The Index Arbitrage Meter illustrates the extent of the premium (or discount) of the lead month futures price above (or below) its fair future value with respect to the index price. A green bar indicates that the lead month futures price is at a premium to (i.e. greater than) its fair future value. A red bar indicates that the lead month futures price is at a discount to its fair future value. This tool is available for Indices and Futures on Indices. To see the Arbitrage meter, make sure "Show Arbitrage Meter" is selected under the "Settings" menu. Click on the desired market data line to select the index. Right click and select Show Arbitrage Meter. We provide the latest Marketwatch news and research from the Trader Workstation. How to access news: Right click any market data line ticker and then choose "Show News". We provide 20 minute delayed Bigcharts over numerous time periods from within Trader Workstation. 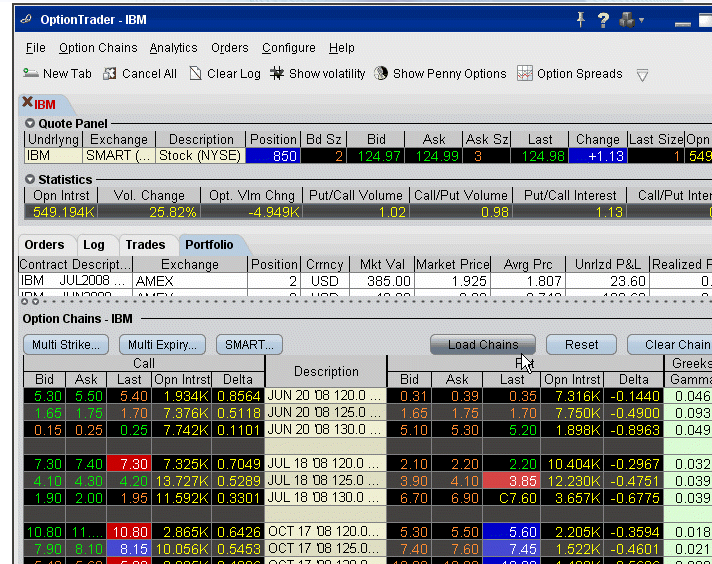 How to access charts: right-click any market data line ticker and choose "Show Graph". Models provide an efficient process to manage multiple trading strategies for clients without requiring open multiple accounts. Client investments are allocated among instruments in the Model based on the Model's allocation ratios as defined by the account manager. In addition to the TWS trading tools above, we offer many great features through our truly elegant Mosaic Interface as well as with our super simple to use Place Trader (WebTrader) platform! Place Trade WebTrader features a cleaner, simpler platform designed for traders who consistently trade in a single category of securities or in a specific market. Intuitive design allows traders to execute their orders without wading through excess information. Our Watchlist tool allows you to view several contracts all together in a small window that can be moved anywhere on your desktop. Create multiple named Watchlist windows, grouping contracts by industry or any other organizational criteria. Manage groups of orders on multiple products, and create order groups modeled on popular indices with ease using our sophisticated BasketTrader tool. Learn to send a basket order, create a Basket File in Place Trader Workstation, manually create a Basket File, and use our IndexTrader to create basket orders based on indices like a seasoned trader. Our Yield Optimizer compares rates for borrowing and lending stock so that you can see projected returns if you invest the unused portion of your account equity. Compare borrowing rates for hard-to-borrow stocks using various strategies. Receive, stage, submit, and monitor orders all from one window with the Place Trader Workstation Blotter, a unit in our suite of specialized order management tools. Receive and create tickets and manage orders through one screen with this sophisticated tool. Create an order at any price, including the best bid and ask, with a single click in the BookTrader price ladder. Transmit orders with a single click or by using a hotkey once you’ve set up Instantaneous Transmit. BookTrader displays a separate window for each contract you select. Submit orders directly from any real-time chart within the Place Trader Workstation using the ChartTrader. Instantaneous orders can be created and sent by clicking directly on any chart or by accessing the Quote Panel. 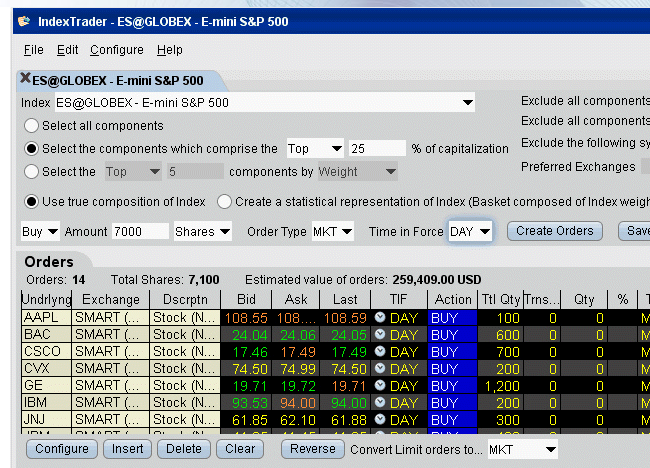 ComboTrader allows you to create orders containing both stock and options legs through a single tool. Although the order will be constructed of separate legs, it will be executed as a single transaction if it is routed directly to an exchange. Evaluate market liquidity more thoroughly by viewing alternative bids and offers from the inside quote through our Market Depth tool. Once you’ve gauged the market and are comfortable with your investment decision, create and transmit orders through the same window. Use the Rebalance window to redistribute percentages of positions in your portfolio that make up your liquidation value. The rebalance function automatically opens and closes positions based upon new percentages that you enter. Add contracts and create orders just as you would from the main trading screen. Use the Import and Export tool to rebalance your portfolio as well. One-click order entry, comprehensive market data, and detailed charts make the Integrated Stock Window, or ISW, a trader’s dream. 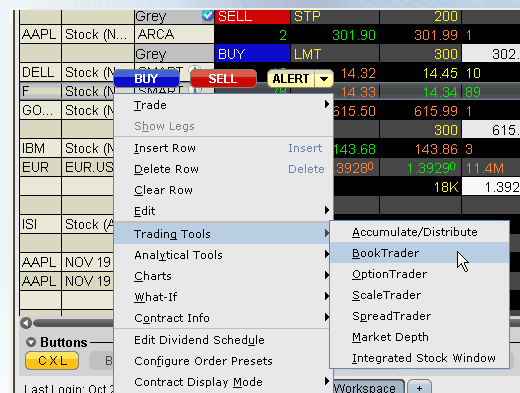 It is a centralized single-symbol window featuring a quote panel that displays data for selected stocks. From one screen you can view Level I and Level II quotes, configure your order & trading tools buttons, create orders, access other order tools, create advanced orders and modify both new and working orders. A multifunctional and configurable standalone screen, the OptionTrader is the ideal tool for investors that actively trade in options. View market data; access your options orders, executions, and portfolio information; create combination Spread orders; and set up specific options chains all through one navigable window. Determine which options will be displayed on your screen by defining criteria such as Options Trader Statistics, strike, expiry, and exchange. A specific feature entitled The Model Navigator enables traders to modify the values they use to calculate options prices. Use the Options Analytics Window to view the rate of change of an options price (with respect to a unit change in each of a number of risk dimensions). Sell calls against long stock positions and sell puts against short stock positions with ease using our Write and Roll Options tool. The Rollover Options function allows you to roll over options that are about to expire to a comparable option with a later expiration date automatically. Use the Write Options function to view all of your long and short positions and write options orders quickly and effortlessly. The Order Ticket functions as an alternate form of order entry for users who prefer to set all order attributes from a single tabbed window. The Basic tab includes basic order and time in force information, all based on the contract shown in the Quote Panel. Also view the Advanced Combo Routing tab. The Adjustable Orders tab is used to define a one-time adjustment to a stop, stop limit, trailing stop or trailing stop limit order. The Scale Trader tab gives you access to ScaleTrader, which allows you to place a scale order designed to help prevent larger sized trades from being subject to increasingly deteriorating prices by scaling your order into smaller, incrementally priced components based on user-specified price and size instructions. The Pegged Orders tab allows you to select from available fields to create a Pegged to Stock options order. The Volatility tab, active when you select a VOL order type, allows you to create options orders where the limit price is calculated as a function of an option volatility that you can modify. Trade volatility and dynamically manage your options orders. The Conditional tab allows you to create a conditional order, which will automatically be submitted or cancelled only if specified criteria for one or more defined contracts are met. The Miscellaneous tab and order fields can be used to apply order attributes and set specific rules for OCA groups. Create custom order sizes via several methods using the Quantity Calculator. Set a general default order size, calculate order quantity, set specific default sizes for each instrument type, or even set precise default size orders for specific contracts. The SpreadTrader allows traders to create and transmit multiple combination orders with two clicks of a mouse. Fabricate your own highly sophisticated matrices of variations on an options strategy for a single underlying, and define the exact display set up of the combination lines within the matrix by assigning specific positions to each parameter of your strategy. Filters permit you to select which contracts will be displayed in your matrix. Simple controls and intuitive filters make the SpreadTrader, an advanced tool, accessible to traders of all experience levels. This trading tool was designed based upon specific market-based needs of our clients. Create combination orders for anticipated mergers between companies through the Merger Arbitrage window.